Combine and press graham cracker crumbs, 3 tablespoons sugar, and margarine/butter into a 10" spring form pan to form the crust shell. Set aside. Beat together cream cheese and remaining sugar until smooth in large mixing bowl. Pour this mixture into the crust shell. Reduce temperature to 250 degrees and continue baking for 35 minutes. Loosen the cake and let cool before trying to remove it. Loved this recipe. Very easy. But the cooking time was not right for me. Still runny in the middle after 40 minutes. Had to add on another 15. But great recipe, will make again. This is the best cheesecake ever! It tastes just simply amazing. But I think there should be way more chocolate chips. It just is great. 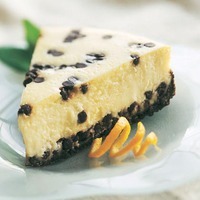 This is the best cheesecake ever! It tastes just simply amazing. But I think there should be way more chocolate chips. It just is great. Catso The Fatso strikes again!!!!!!! MWAHAHAHHHHAHHAHHAAHHAAAAHHAAHHAAHHA CATSO THE FATSO STRIKES AGAIN!!!!!!! MWAHAHAHAHAHAHHAAHAHAHAAHHAHAHA YES!